At O. Jacobsens Maskinfabrik the employees had to lift the slabs several times a day from a pallet to the machine and from the machine to the measuring and washing areas and then on to distribution and preparation. At Hosta Industries, production of large orders for a whole range of slabs was handled manually. Repetitive one-sided work was part and parcel of the production process. The company therfore wanted to streamline the process and eliminate monotonous physical work for the staff. KAMF is a machine factory where they use a combination of automation and robot solutions, as well as Lean and 5S practices. After KAMF’s first robot investment in a CNC assistant, the firm had so much work on their books that they already felt the need for yet another one. The mozzarella dairy in Rødkærsbro was looking to streamline their production line, as had been the case with two other lines. They also wanted to minimise man-hours, as the manual process involved lots of heavy lifting for the employees concerned. The solution delivered to Thise includes two Kawasaki robots. The robots are installed in order to pack and palletise orders. According to Jens Møibæk, Technical Supervisor, these two work processes used to be fully manual before BILA’s solution was installed. The solution for Dugnaden is a fully automated system with AVG operation. In other words, the previous completely manual order management has become automatic. Bremnes Seashore has optimised its production because keeping up purely in terms of capacity turned out to be challenging. The principle remains the same as before, but their current facility is now extended and equipped with a robotic cell. The supply lines have been modernised, providing a larger buffer, increased capacity and greater flexibility. Siemens Gamesa Renewable Energy is a leading global windmill player with several departments in Denmark. 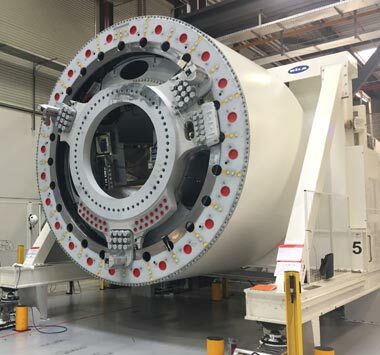 In Brande they, among other things, produce generators for their 3.0 MW wind turbines approached to their onshore customer segments.